At the elderly care home in Semipalatinsk, we met 85 year old Praskovya. Semipalatinsk, or Semey, is a city 150 kilometers from the main Soviet nuclear weapons test site. 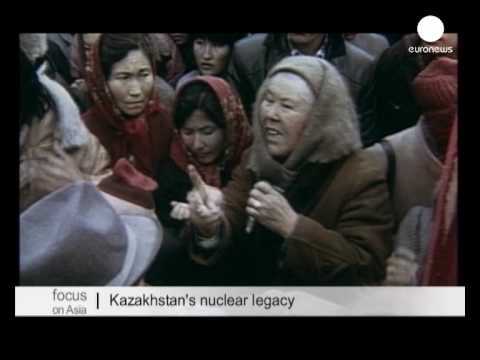 After a wave of popular protests, the Semipalatinsk site was closed in 1991. It had carried out 456 secret nuclear tests. However, the closure could not reverse the environmental damage to the region, which has more than a million inhabitants, most of which are villagers. Radioactive fallout from nuclear blasts have given Semey and neighboring villages abnormally high rates of cancer and birth defects. Local oncology centers are screening tens of thousands of patients, trying to detect and treat tumors at early stages. People living in the area are still predisposed to breast and pulmonary cancer. Scientists stress that there is not enough research to link each individual case to radiation. However, it is clear that the nuclear legacy keeps haunting younger generations. Infant mortality here is five times higher than the average for developed countries. Embryonic defects are widespread, and cancer strikes teenagers as well as adults. Dozens of little children abandoned by their parents live in the local orphanage. A fifth of them are mentally or physically disabled. These conditions have become increasingly frequent in the last few years. Innocent victims of atomic weapons keep suffering twenty years after the last explosion – a terrible legacy of the ruthless past.